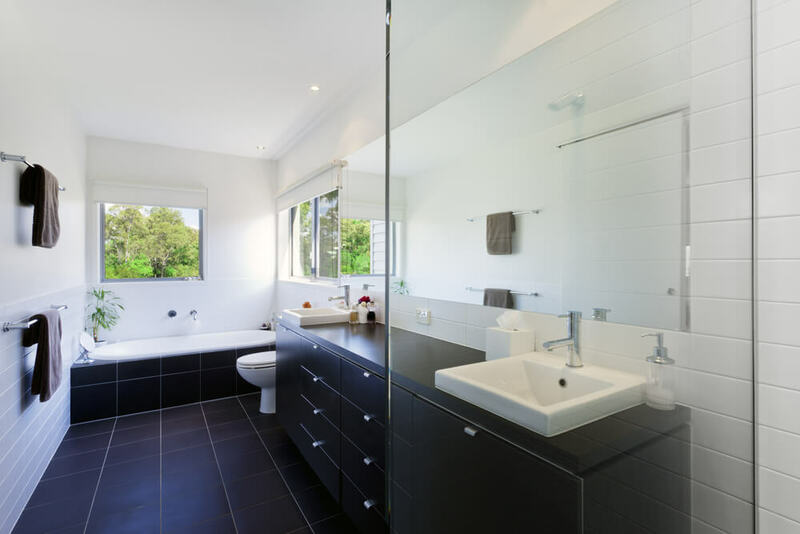 Are you anticipating a bathroom remodeling project but are unsure of where to start? 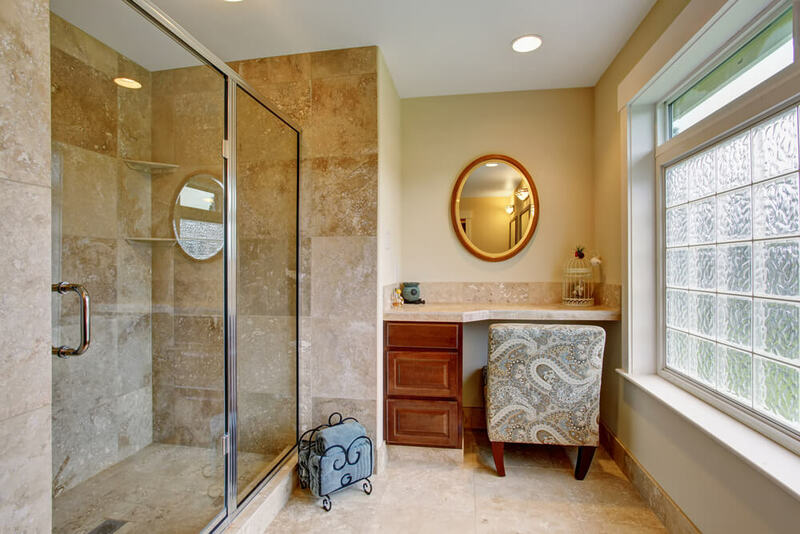 A well-designed bathroom is essential for maximizing functionality and beauty. 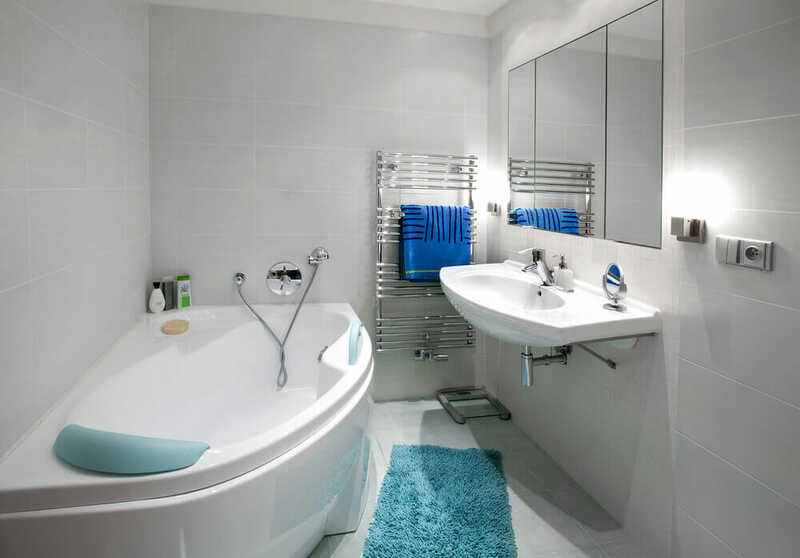 When a bathroom has been laid out well, the amount of floor space available is less important. 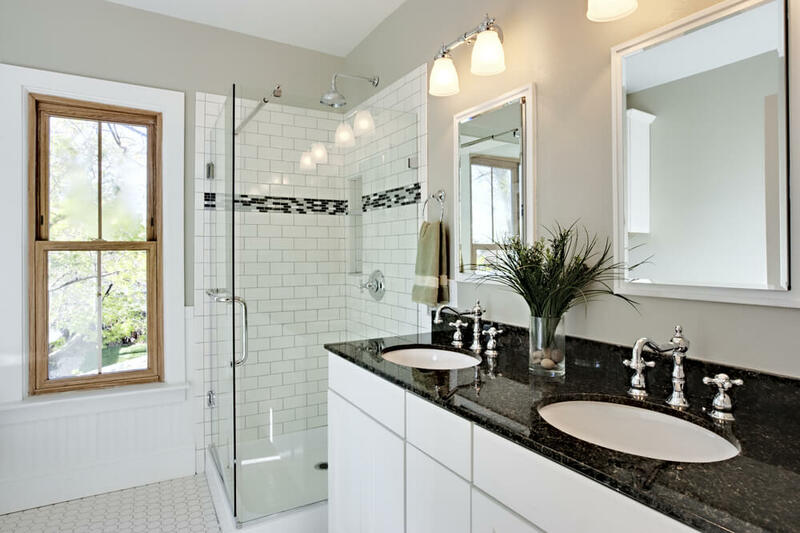 But a poorly-designed bathroom can create daily frustration for homeowners and renters. This lack of foresight causes vanities to be installed to close to a door so that you cannot open it fully. Another common mistake is the installation of a toilet in the direct line of sight upon opening the door; the toilet should not be the first thing you see. Light – Small spaces always appear larger when light colors are applied. These colors reflect available natural light and reduce shadowy corners which creates the illusion of more space. This is especially valuable in bathrooms will limited or no natural light. 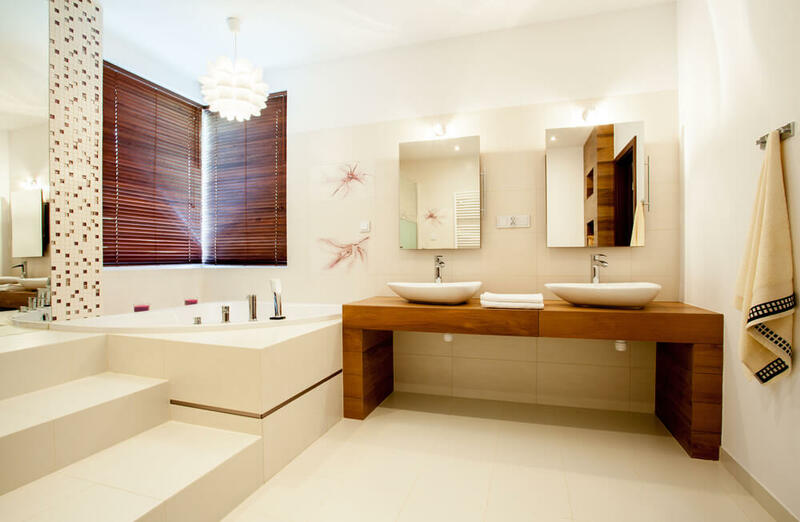 As well, a well-lit bathroom is ideal for applying makeup, shaving and other bathroom activities. Color – Color is part of what adds personality to a space. In bathrooms with a neutral color foundation, accent colors can be easily added through linens, art and accessories. 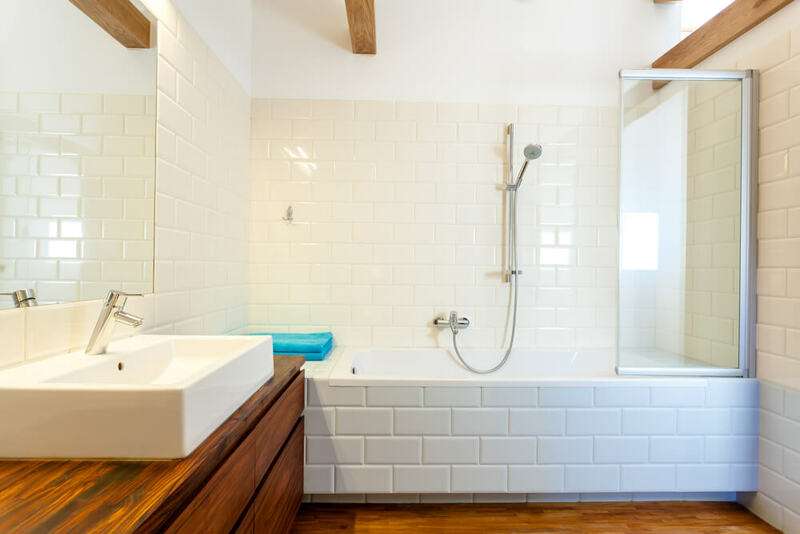 When it comes to tile, a way to add color without committing to an entire bathroom of vibrant tile is to introduce a band of colorful tile among a classic white or grey subway tile. If you are a risk taker you can introduce color, for example, by installing a blue vanity or entire shower wall of colorful mosaic tile. 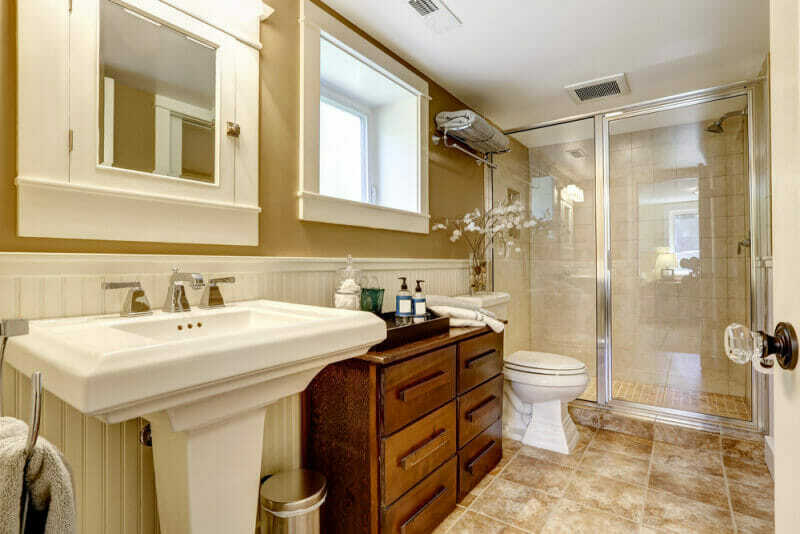 Flooring – Bathroom flooring has multiple functions. First, it acts as a barrier between the inevitable spillage of water and the permeable materials underneath. Choose flooring that is resistance to moisture and less porous. 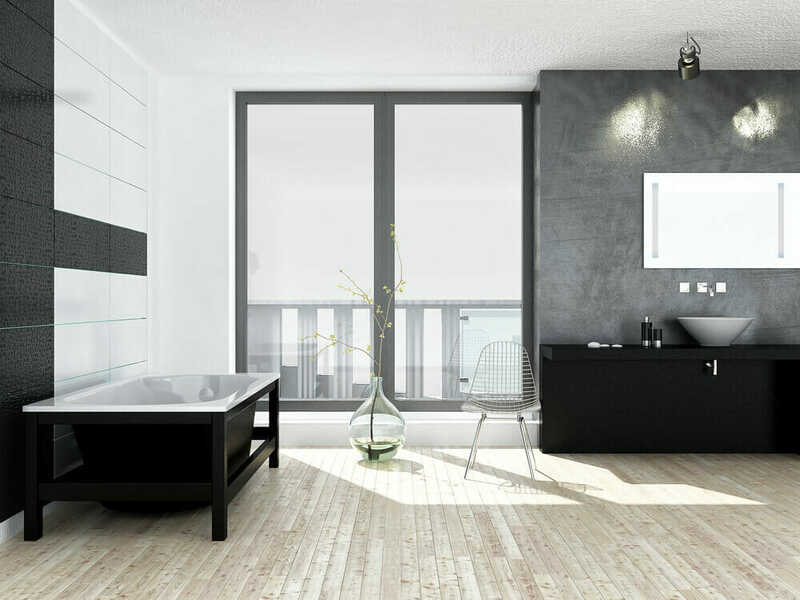 Materials ideal for bathroom flooring are linoleum, vinyl and tile. 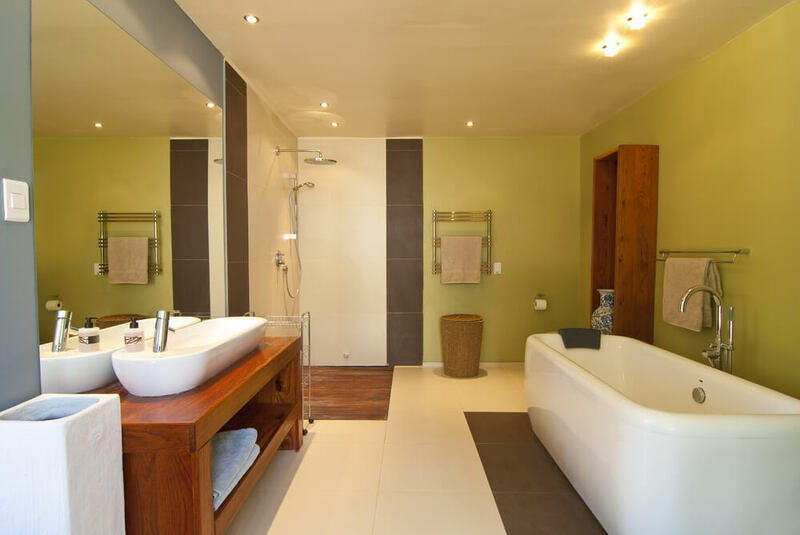 Secondly, a bathroom floor can act as a design foundation for the rest of the space. Therefore, choose quality materials with classic color schemes to ensure the longevity of the bathrooms design aesthetic and functionality. 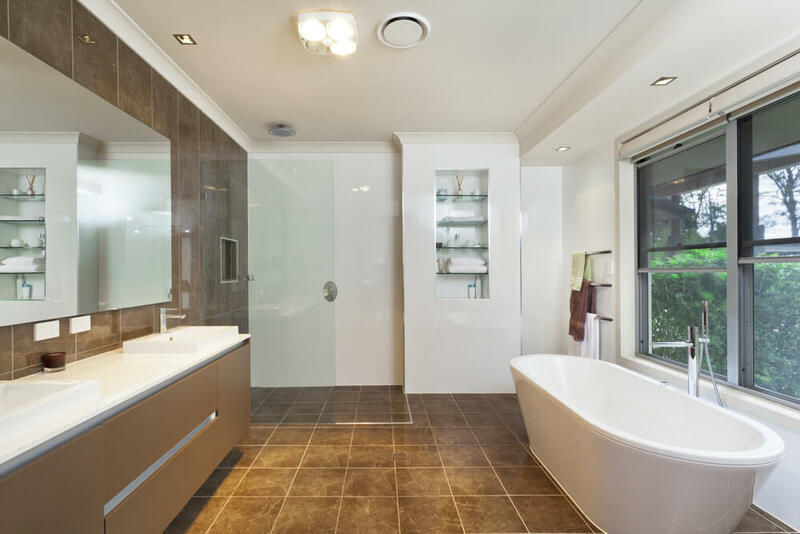 Changing out the flooring in a bathroom can be costly and shouldn’t be done too often. Occupants – Who will be using the bathroom? Is it strictly for the kids, a master ensuite or a small guest bathroom. These factors will influence the amount of money invested, the quality of materials used and the style of decor. 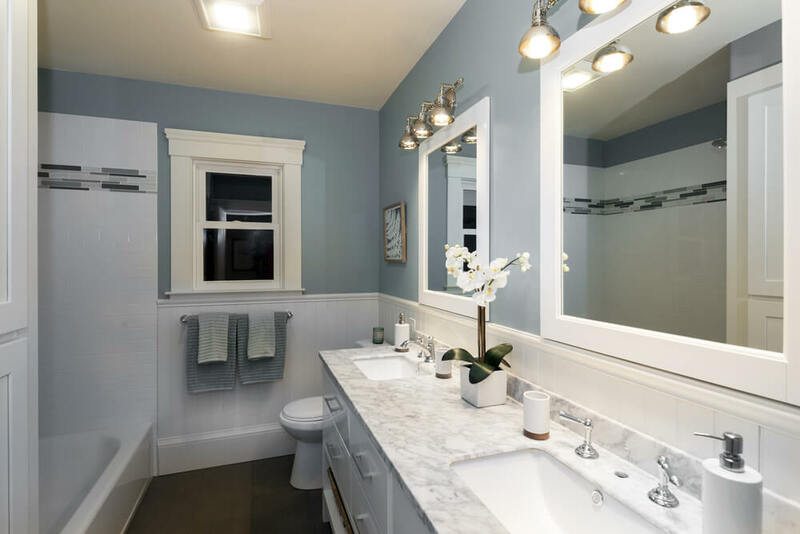 Location of existing fixtures – When renovating a bathroom, the most cost-effective approach is to maintain the location of the toilet, sink and bathtub/shower. In a full renovation, you may wish to move these elements for greater use of the available floor space. Keep in mind that the cost involved in these two approaches can vary greatly and will affect the bottom line of your budget. Feel free to peruse the following pictures to narrow down your personal design aesthetic and to choose elements that work for you and your budget. 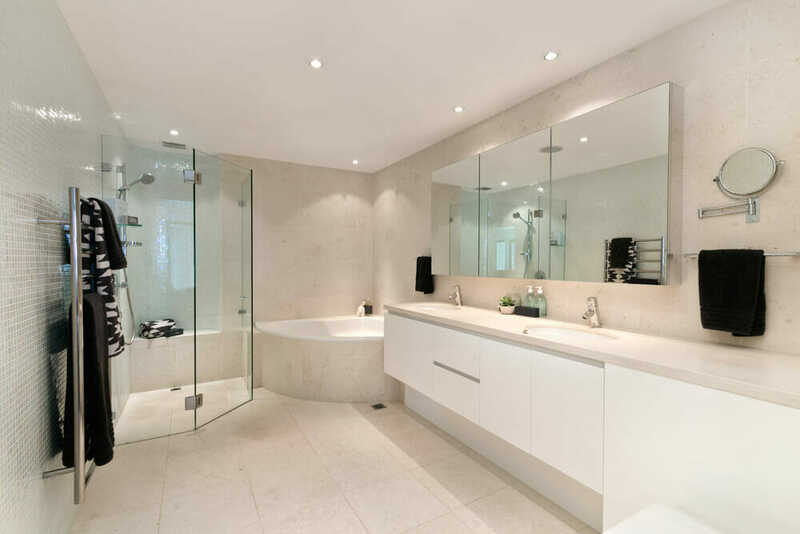 Consider consulting a bathroom contractor to assist you to designed and building the ideal bathroom for your home and family. 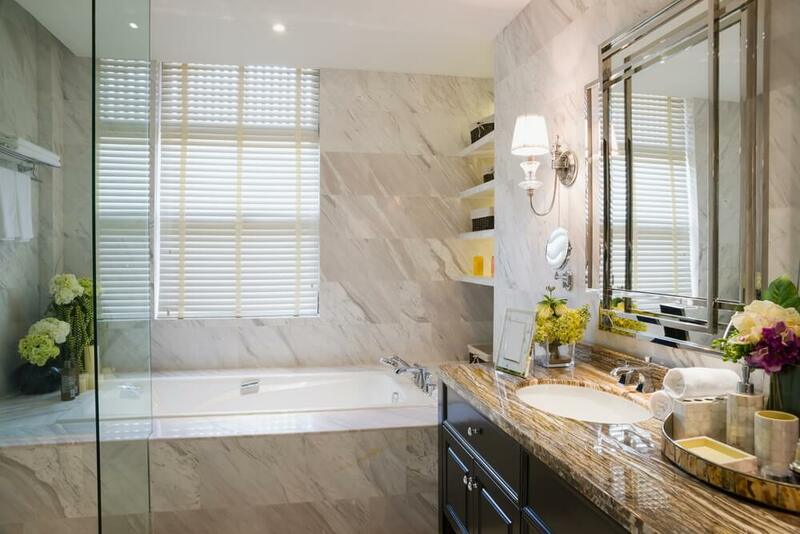 The step up tub, wood vanity and bay windows are a perfect addition to this luxury bathroom. 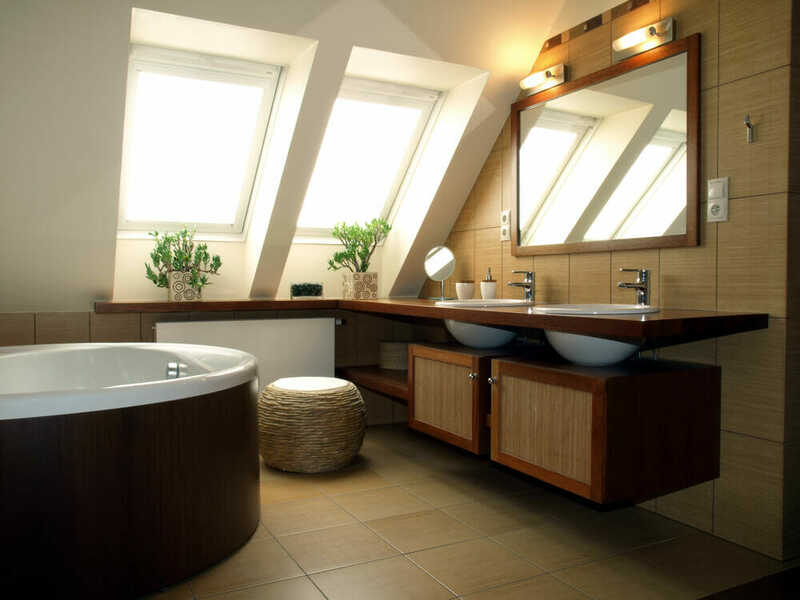 This bathroom optimizes storage space by installing built-in cabinets in the space under the peaked ceiling. 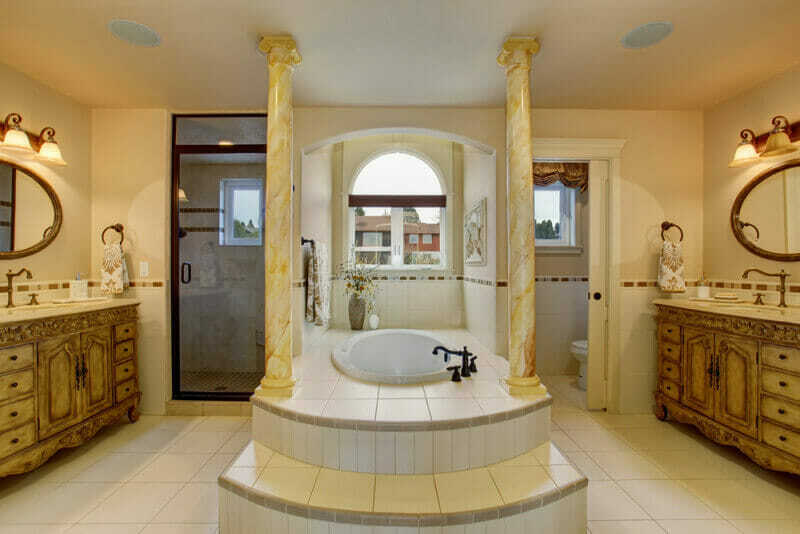 This extravagant bathroom’s focal point is the large, raised jacuzzi tub and marble columns. The basketweave, floor tile in this contemporary bathroom adds depth and interest. 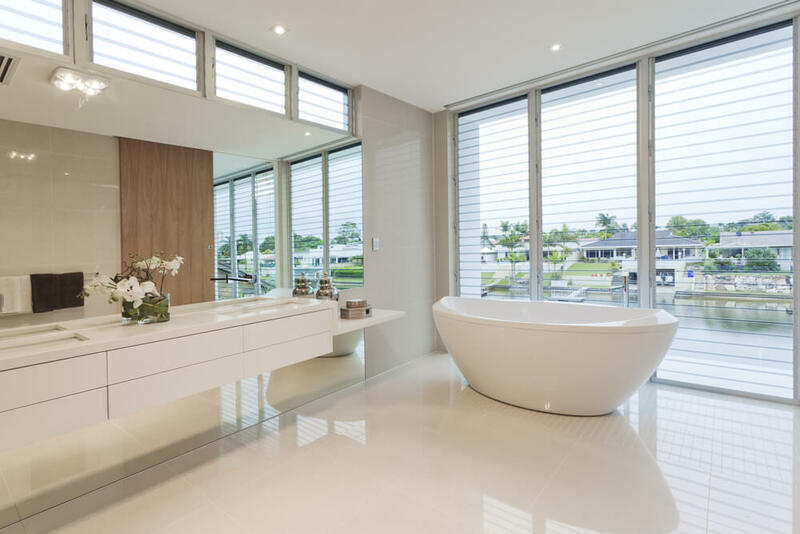 When your bathtub is placed in front of a window, ensure that you have quality window coverings for privacy. Rather than using a conventional vanity, consider retrofitting an antique dresser to serve the purpose. 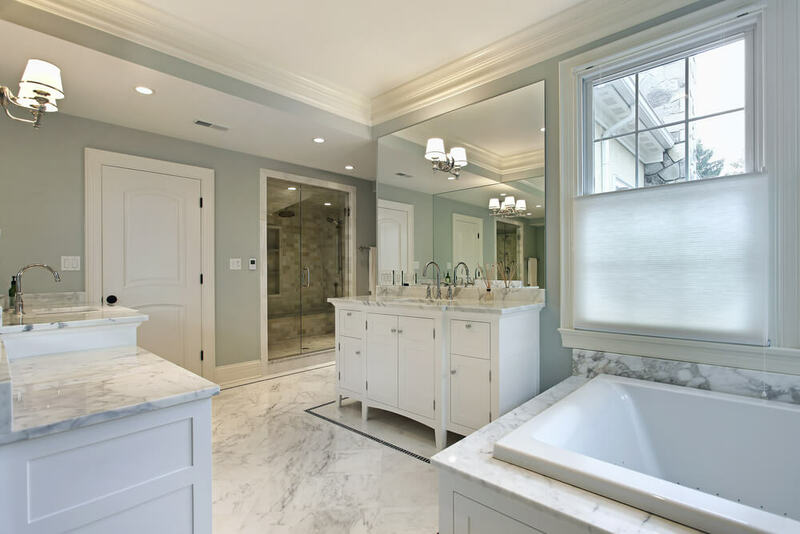 This traditional bathroom is designed with attention to detail, from the beautifully framed mirrors to the gorgeous window coverings. 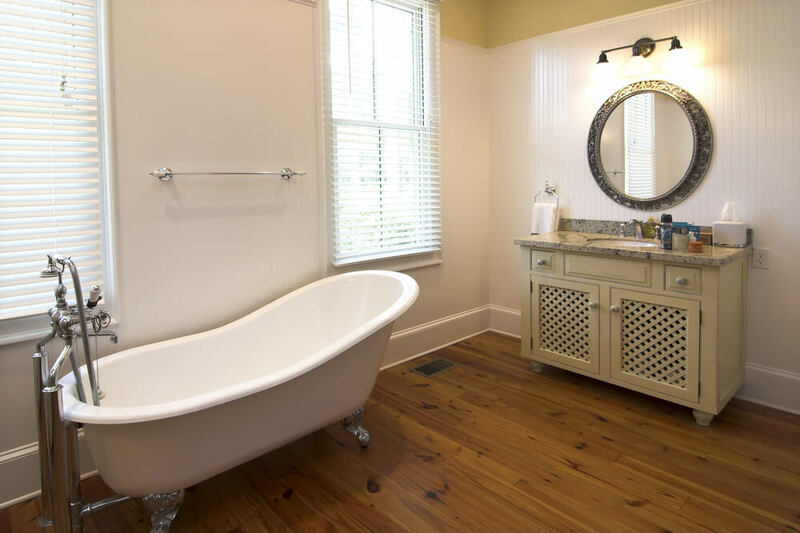 Additional storage space is created by installing cabinetry into the space surrounding the bathtub niche. 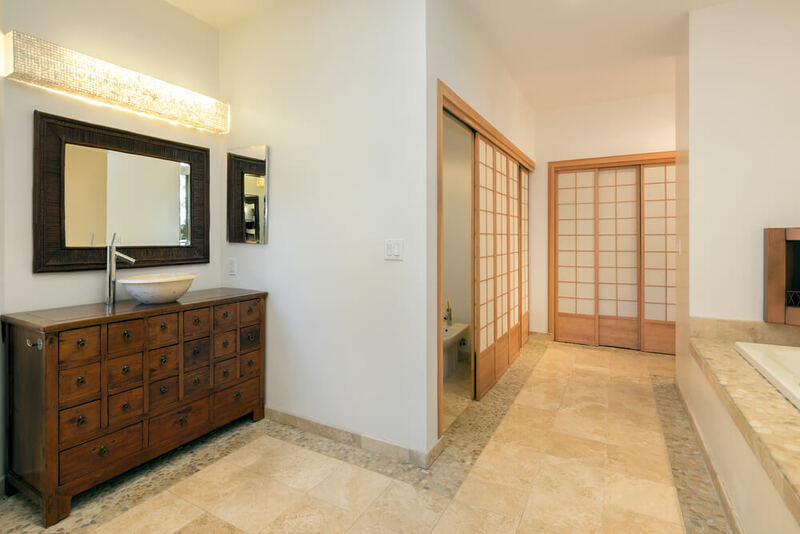 This bathroom creates a tropical feel with rich, natural woods and vibrant, aqua tile. Consider using regular curtains, with an additional plastic curtain insert, for your shower curtain. 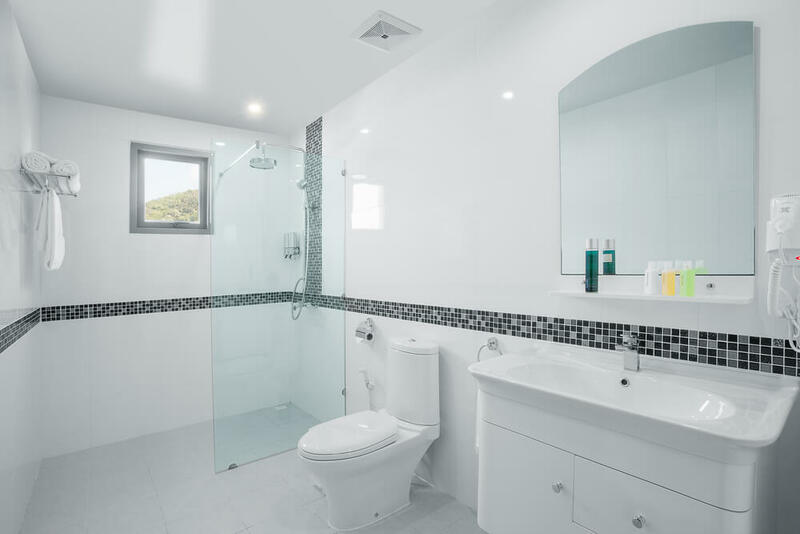 This bathroom is designed to be a wet-room with continuous tile throughout and floors that slope toward the drain. 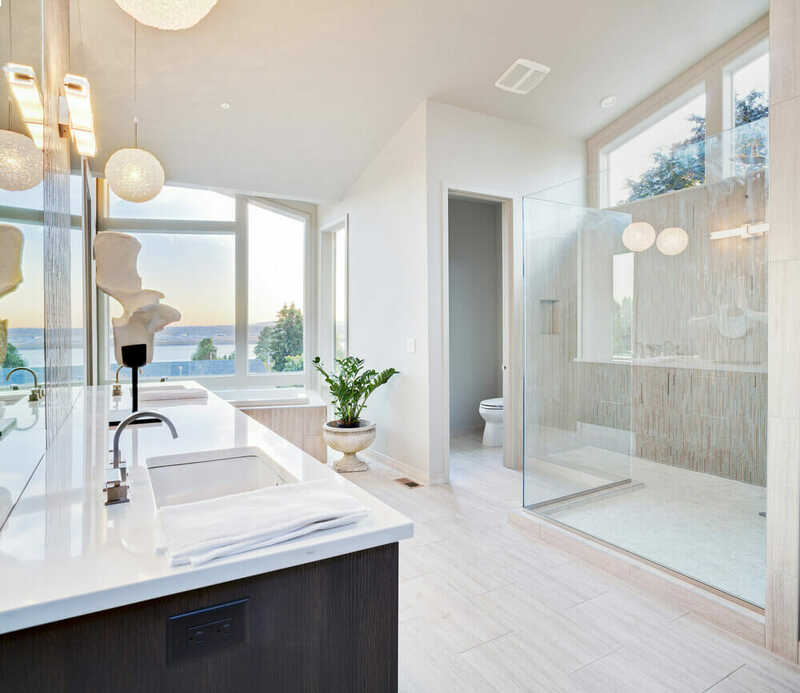 A rain shower head adds to the spa-like aesthetic of this bathroom. A bathtub can be installed in a unique way by utilizing a floor-mounted faucet and shower head. 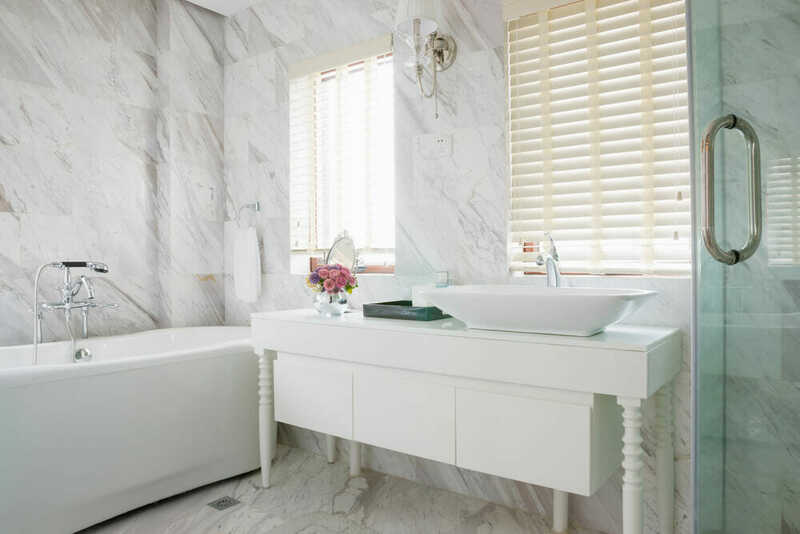 The cream and gray color palette in this bathroom coordinates beautifully with the marble flooring. 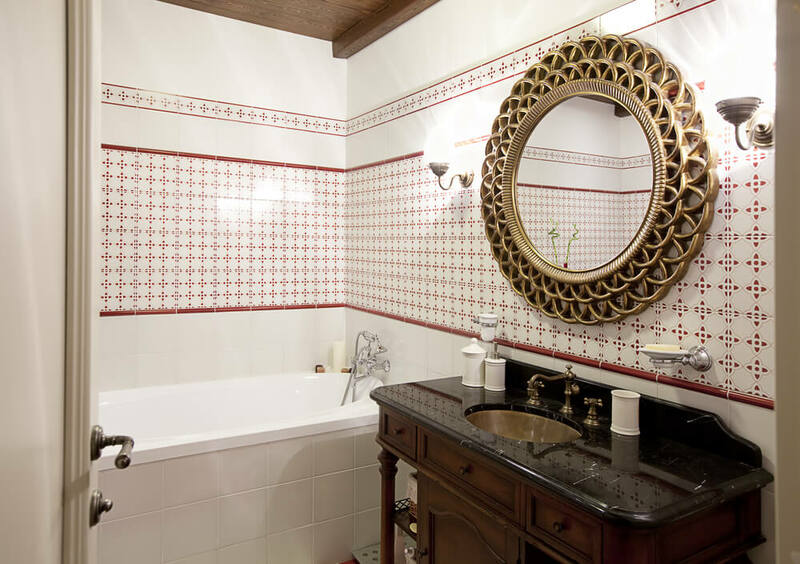 The detailed, tile work in this bathroom is both decorative and functional; no additional ornamentation is needed. A fireplace is an unexpected, but welcome, touch in this grand master ensuite. A large, hanging overhead fixture provides lots of light in this windowless bathroom. 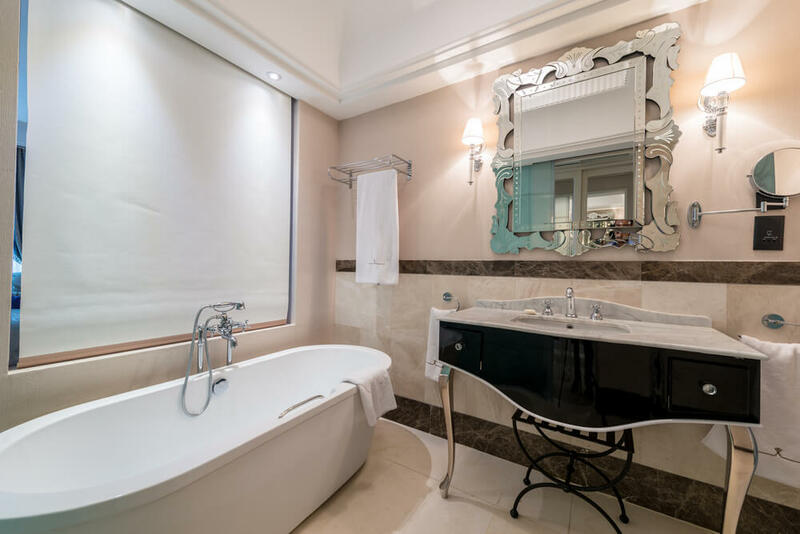 The inset, jacuzzi tub provides the perfect place to relax at the end of a long day. 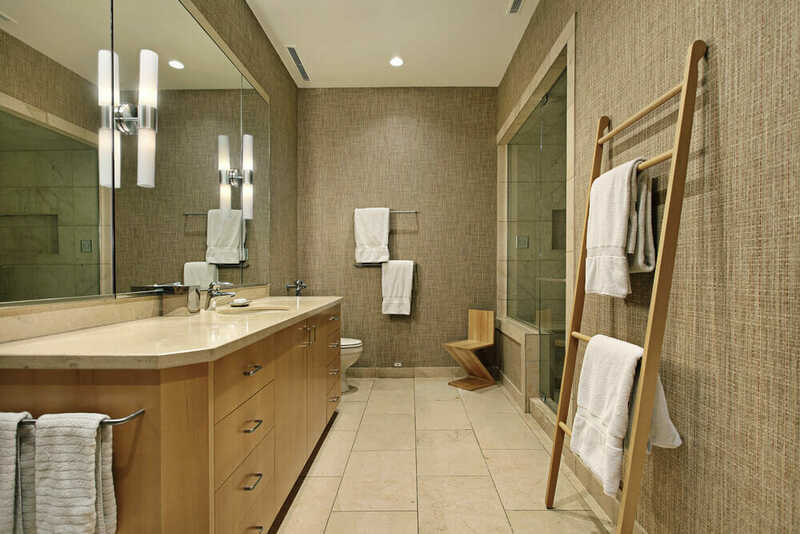 This space optimizes every inch to include a large, jacuzzi tub, shower and his and hers vanities. Built-in cabinetry installed on the counter provides lots of additional storage and a natural division between the two sink areas. The unique, tiled feature wall provides an unexpected touch to this intimate bathroom. Light, neutral color schemes always create the illusion of a larger, light-filled space. 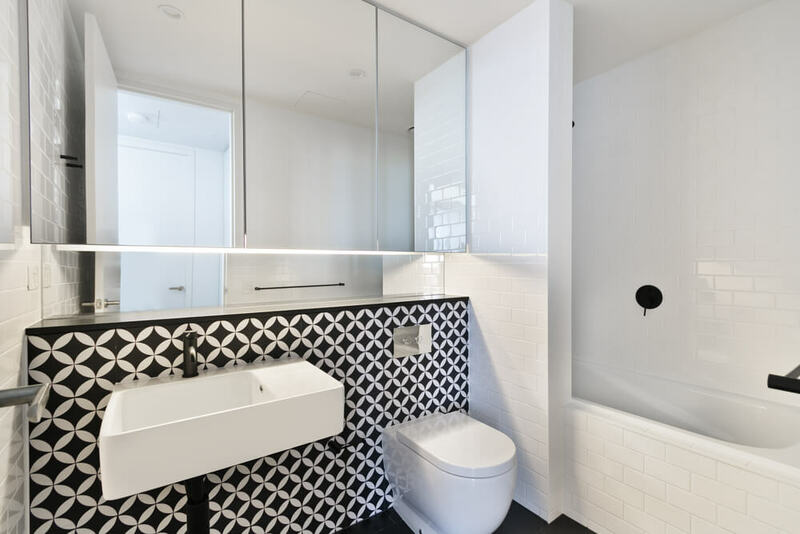 The graphic tile pattern ties in perfectly with the black floors and fixtures. 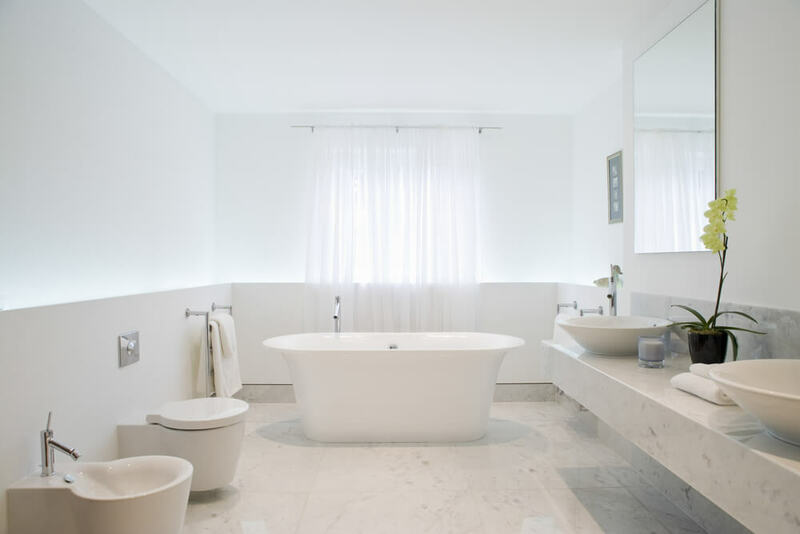 If space allows, consider hanging a pendant light or chandelier above the bathtub area. 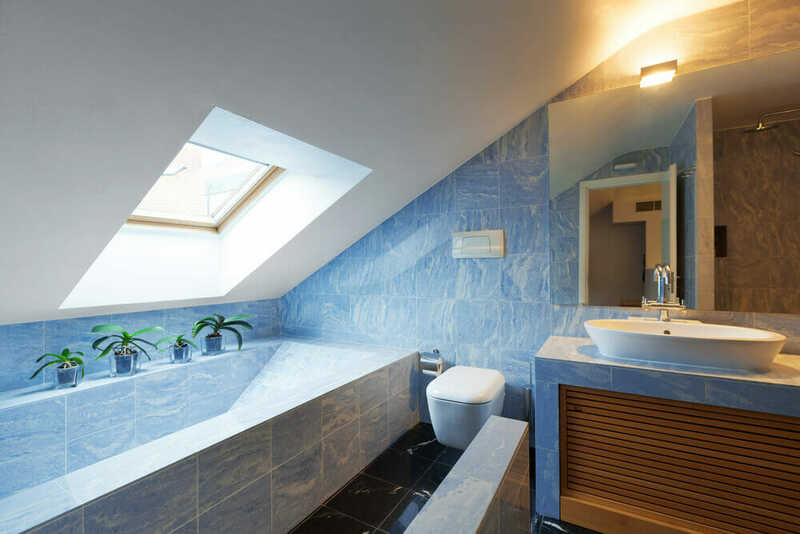 A skylight can provide lots of natural light to an otherwise windowless, attic bathroom. 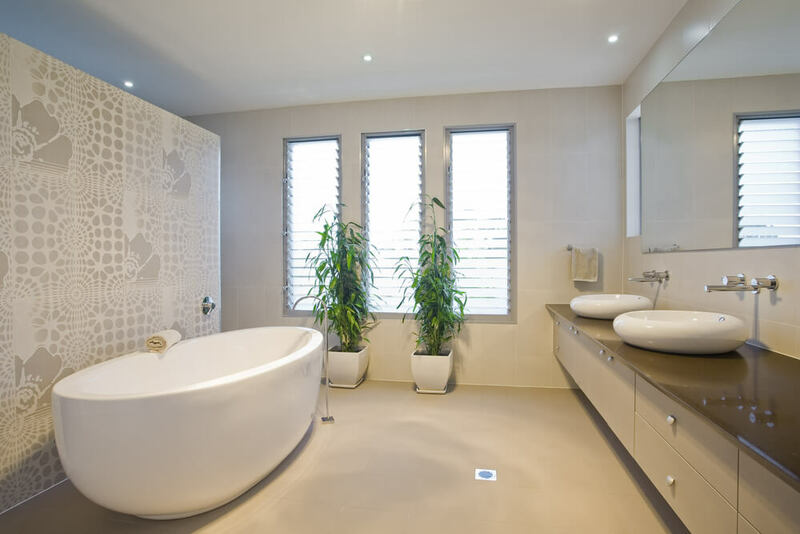 An effective way to create a seamless look in a bathroom is to tile the area surrounding the tub as well. 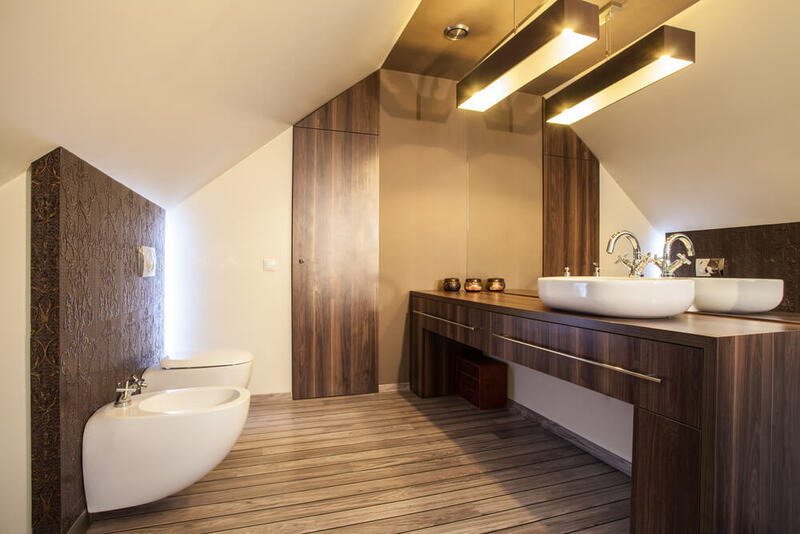 The warm wood tones and gold accents in this bathroom provide create a comfortable, welcoming aesthetic. The rustic wood, floor-to ceiling storage space provides plenty of room for linens, towels and bathroom accessories. A clawfoot tub is both functional and beautiful – a piece of artwork in itself. 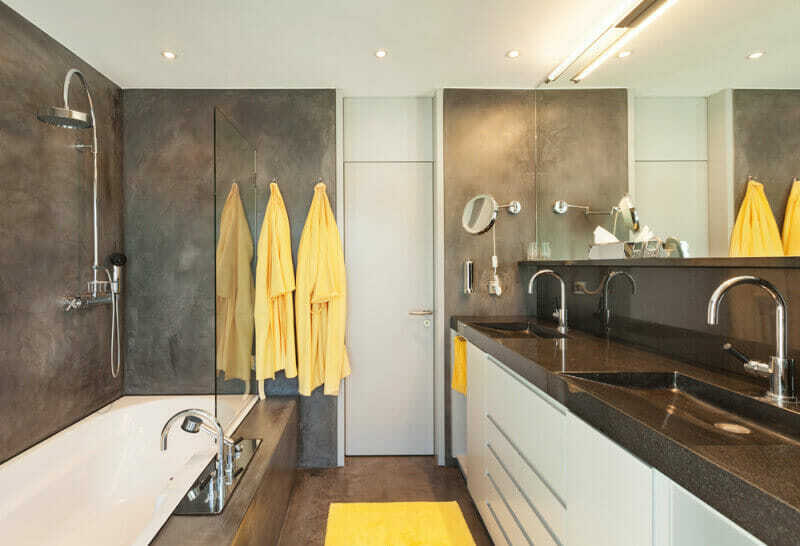 The space beside the shower is maximized by the installation of a small, vanity area. 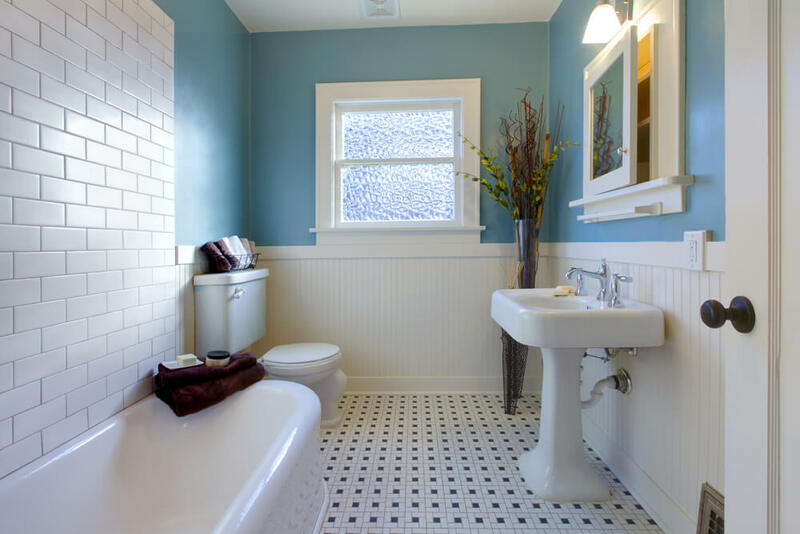 A blue color palette is always a great option for a bathroom as it references the nature of water and creates a calming effect. 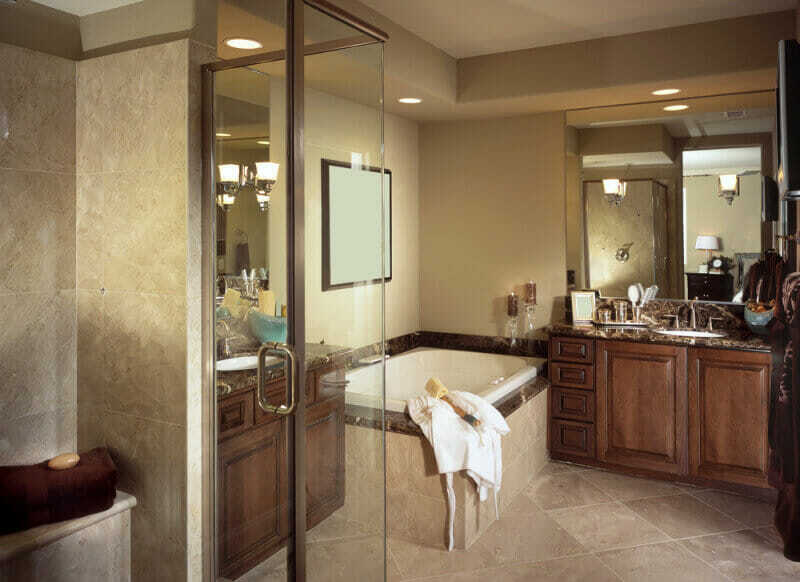 As in beautifully-framed windows, this glass, shower surround is both functional decorative. 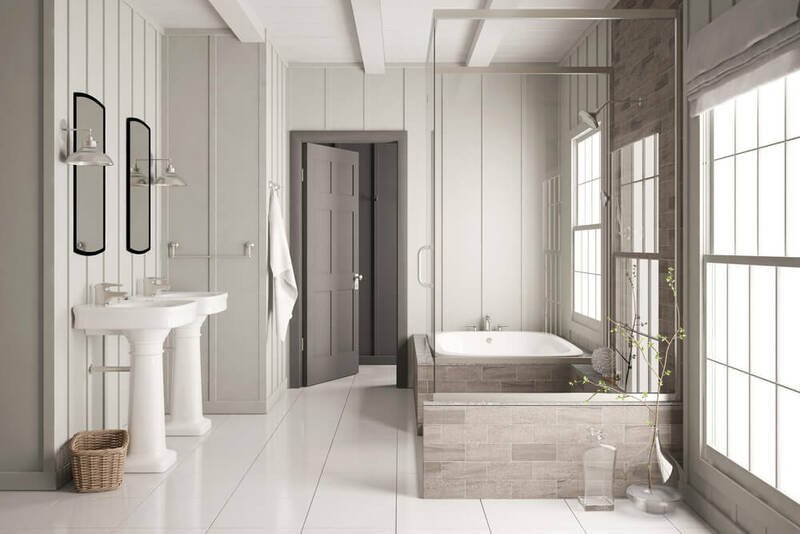 This bathroom combines both modern and traditional design with furniture and accessories that contain classical lines and contemporary finishes. Rather than purchasing conventional bathroom furniture, consider using a vintage dresser as additional bathroom storage. Classic, white, subway tile is a timeless addition to any bathroom. It creates a clean, contemporary aesthetic. 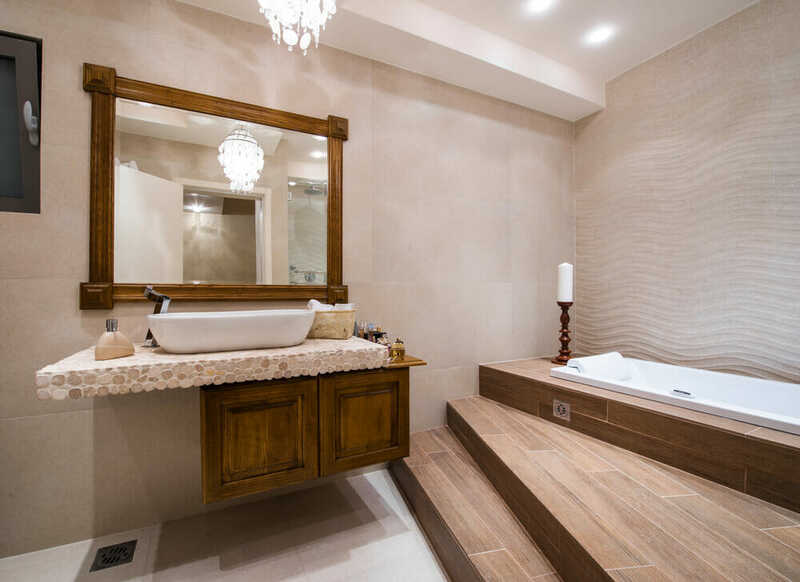 The tumbled-stone countertop and wood floors bring a touch of nature to this spa-like bathroom. Floating shelves installed in a niche above the tub provide a place for folded towels and decorative accents. 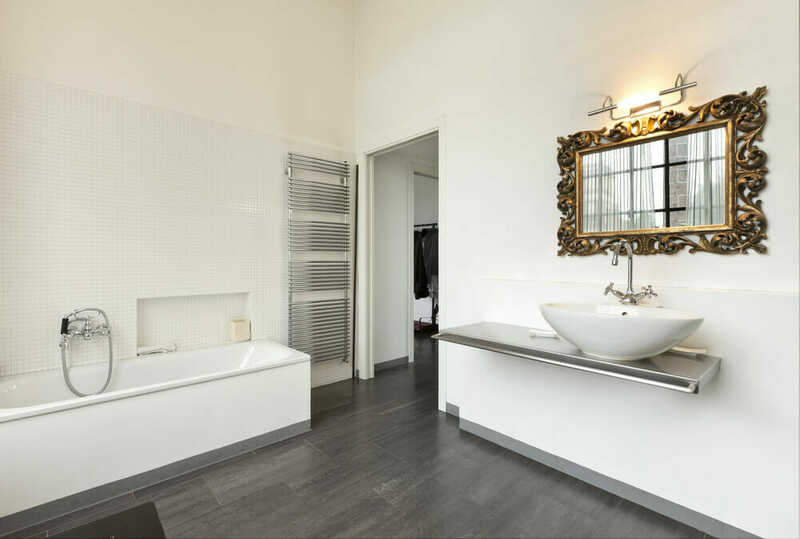 The floor-to-ceiling mirror in this bathroom creates the illusion of additional space and plays beautifully with the sleek, white flooring. 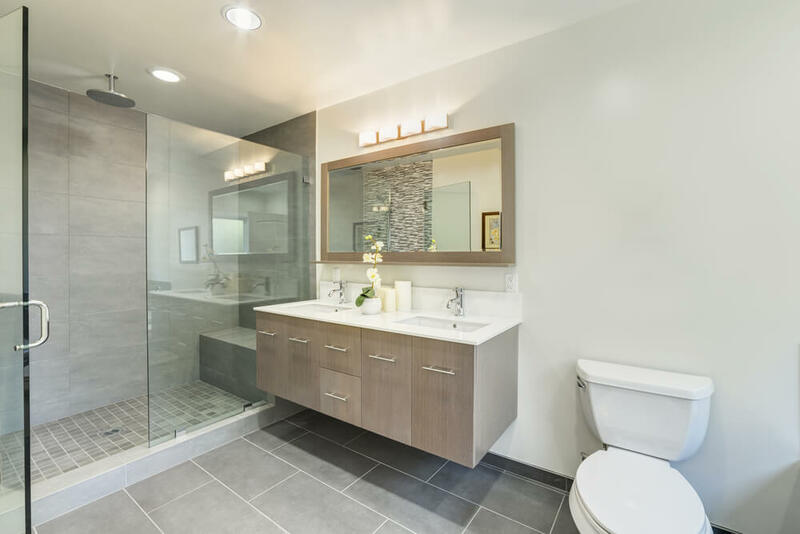 This bathroom features a seamless, glass shower door that provides separation from the shower area but at the same time allows the sight line to continue through the length of the room. 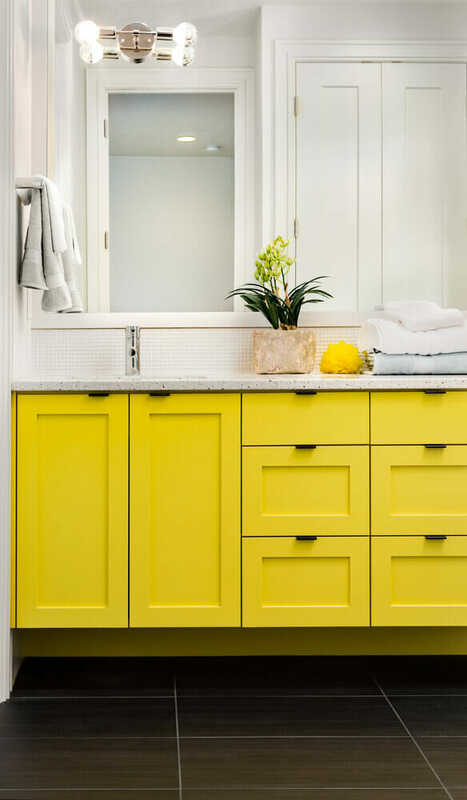 A colorful vanity is a fun way to add a pop of color in a small bathroom. 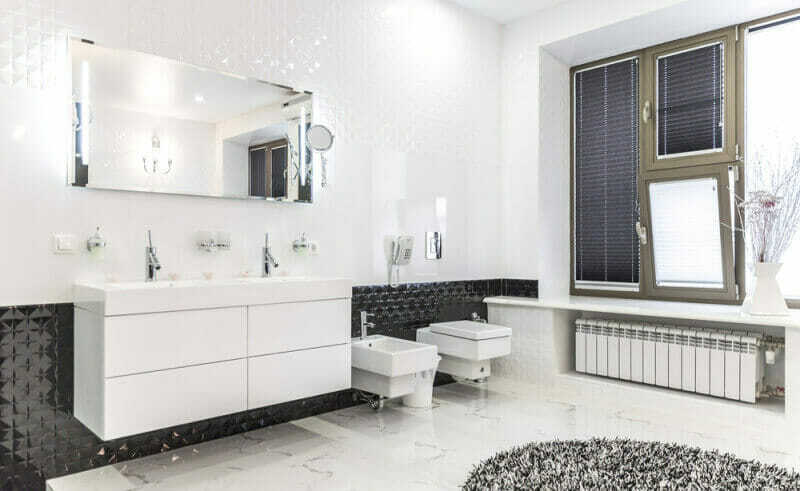 Consider installing your shower curtain in a style used in other rooms of the house, as shown above, with two curtains, rather than one and incorporating tie-backs. The unique design of this tub makes it possible for it to be included in this tiny bathroom. This bathroom provides additional storage for bathroom accessories and plants by including a small, corner shelf and wide window sill. 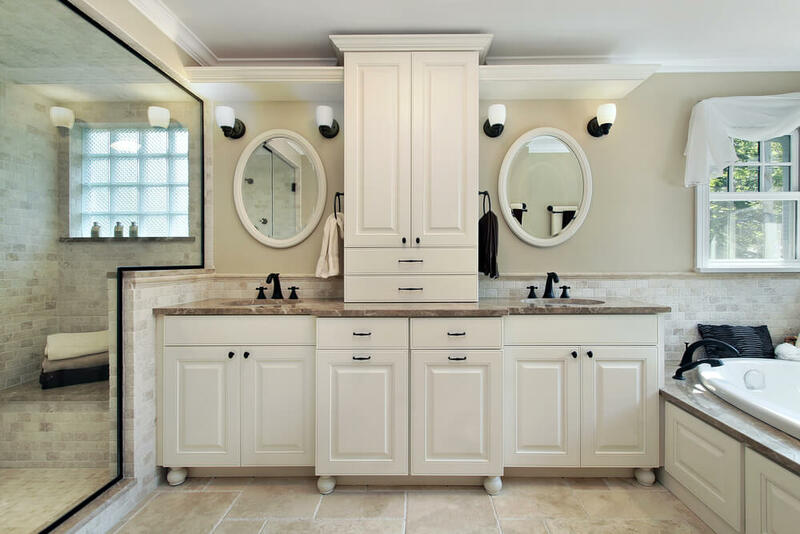 This bathroom creates a cohesive look by installing the sample cabinet style on the built-in, vanity and tub surround. 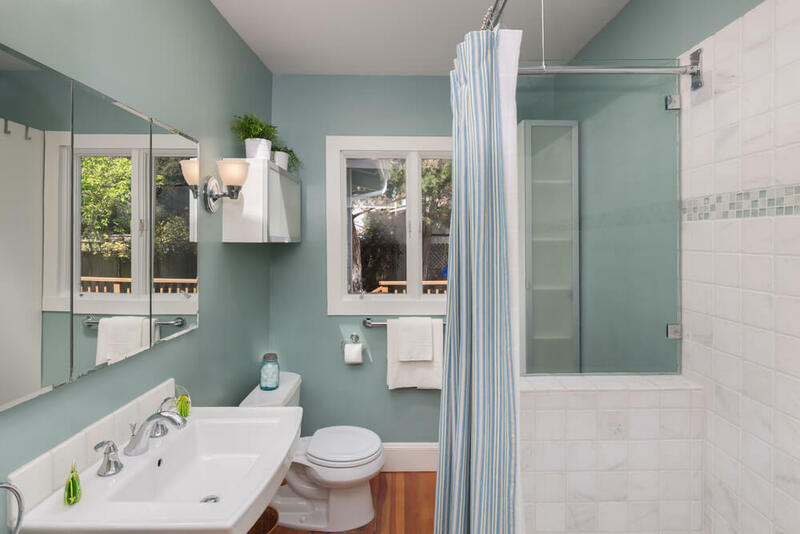 Pops of deep blue and lime green contrast beautifully with the white and gray bathroom tile. 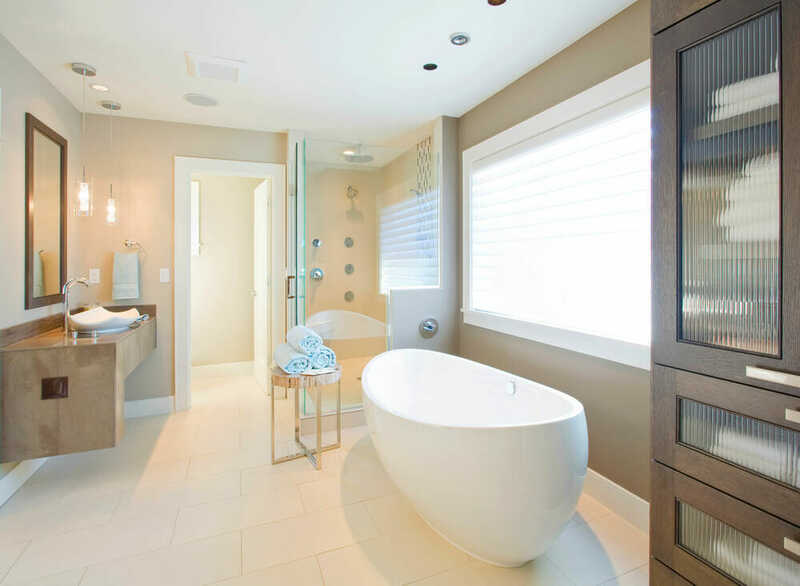 This bathroom features a deep bathtub inset in a wood tub surround that is angled out from the wall. 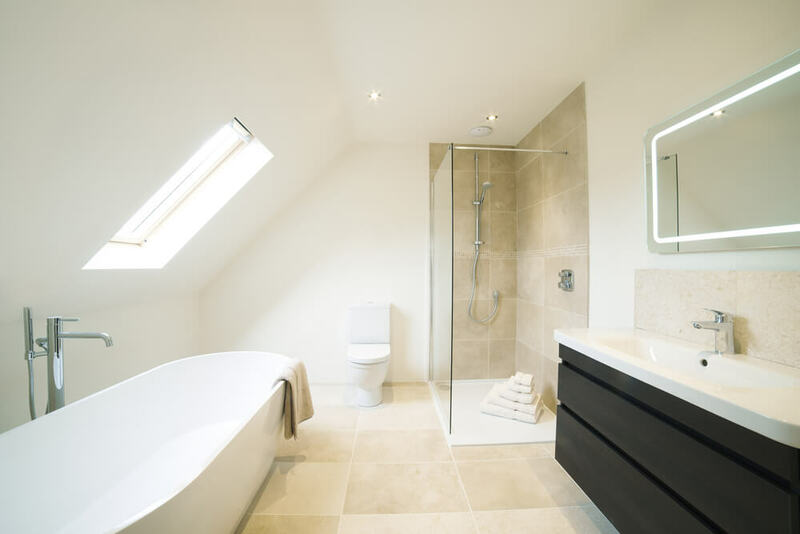 This modern country bathroom provides lots of storage with double, wood wardrobes. Floor to ceiling tile provides a seamless surface area to repeal water while also providing a beautiful backdrop. 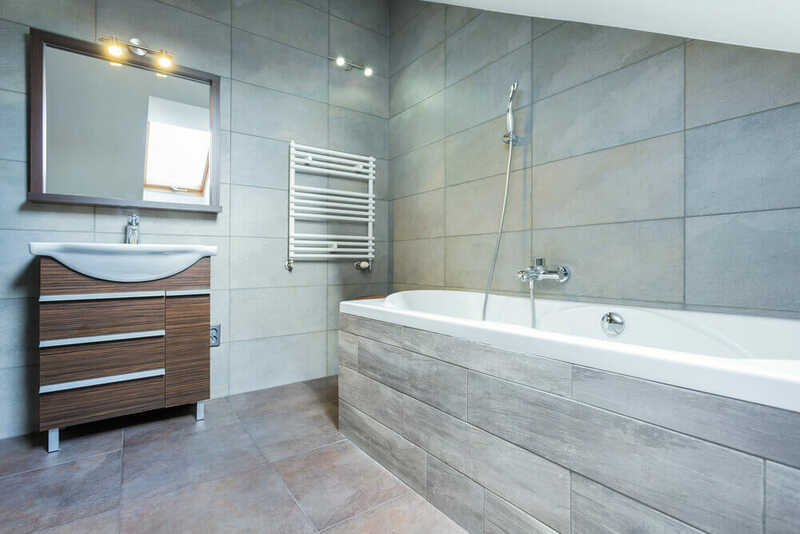 Accenting inexpensive tile with a few sections of a higher-priced tile is a great way to make your bathroom renovation budget go a little further. While wood paneling is not typically seen in bathrooms, it works perfectly in this industrial bathroom. 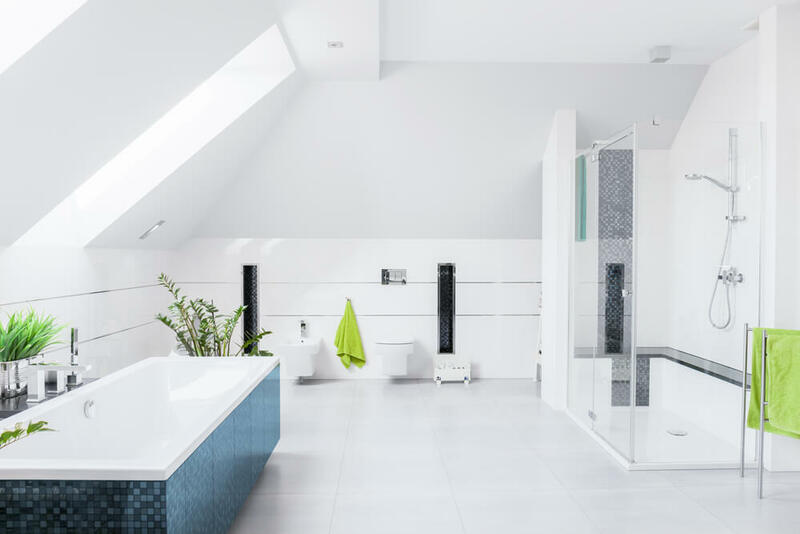 Low profile toilets and bidets are ideal because they take up limited space and are easily hidden beside bathroom furniture. 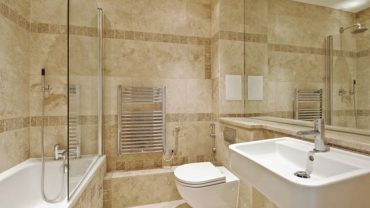 When choosing tiles for a small bathroom choose those large square or rectangular ones if you wish to create the illusion of more floor space. 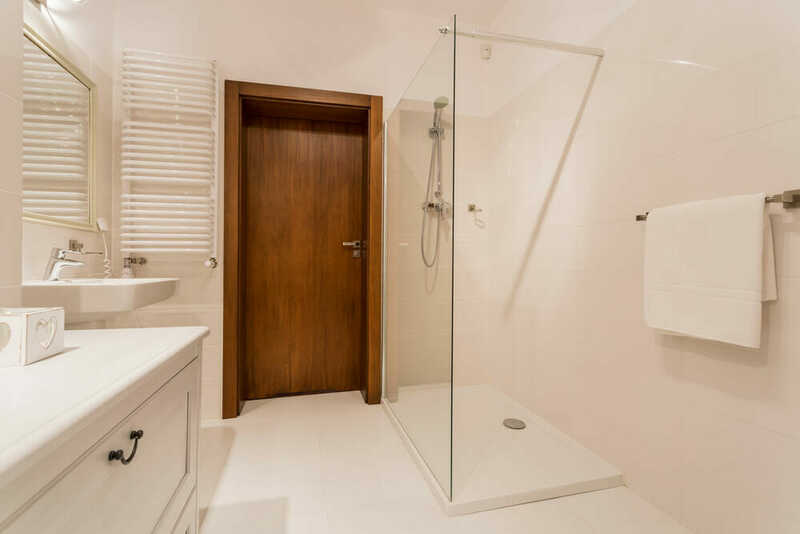 Narrow bathrooms can accommodate a shower when a glass separation and low shower base are installed. The installation of inset bathroom sinks creates a seamless finish and makes bathroom clean up a breeze. 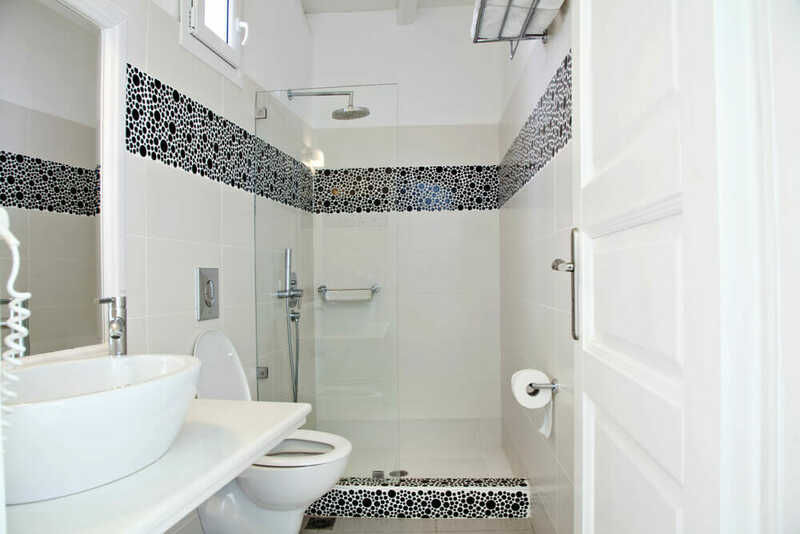 Various tile styles can be incorporated in one bathroom space as long as they contain similar color schemes. This vanity provides a traditional twist on modern design by incorporating decorative legs. 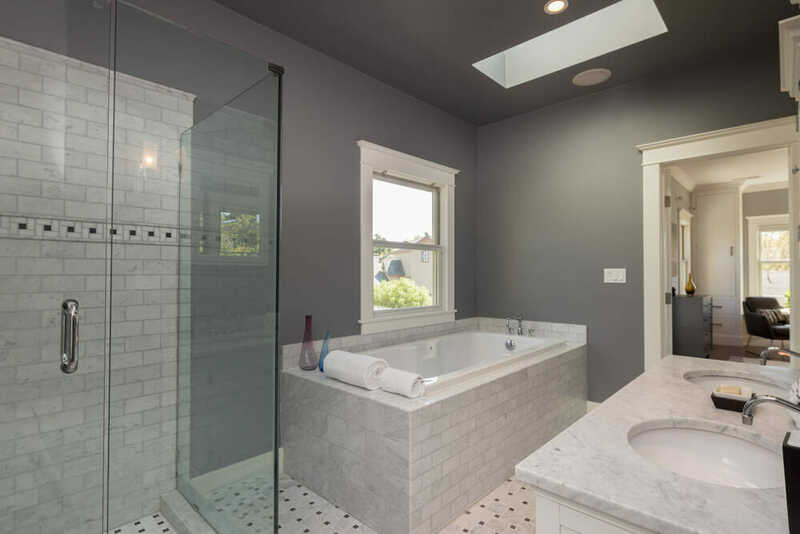 Glass blocks installed in a bathroom provide an additional light source while maintain privacy. Rather than fill in the window space, the vanity accommodates the window by offsetting the sink and faucet. 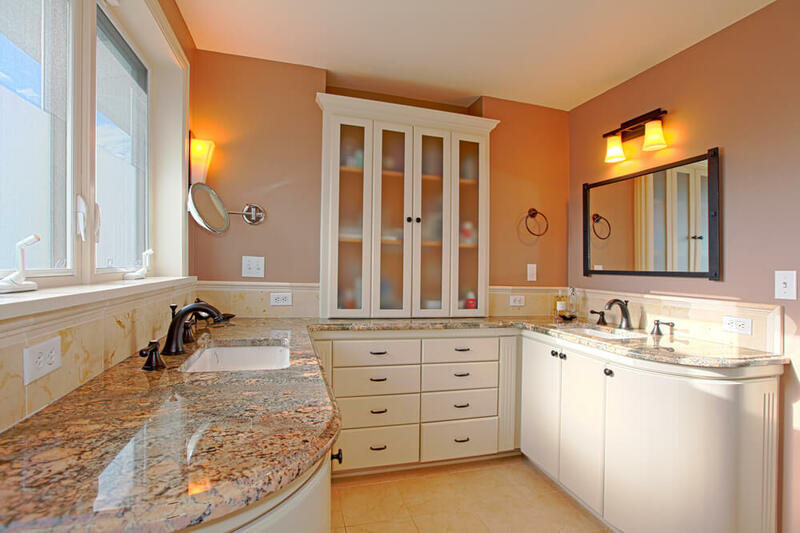 This bathroom accommodates a makeup prep area and double sinks by installing one, seamless cabinet. 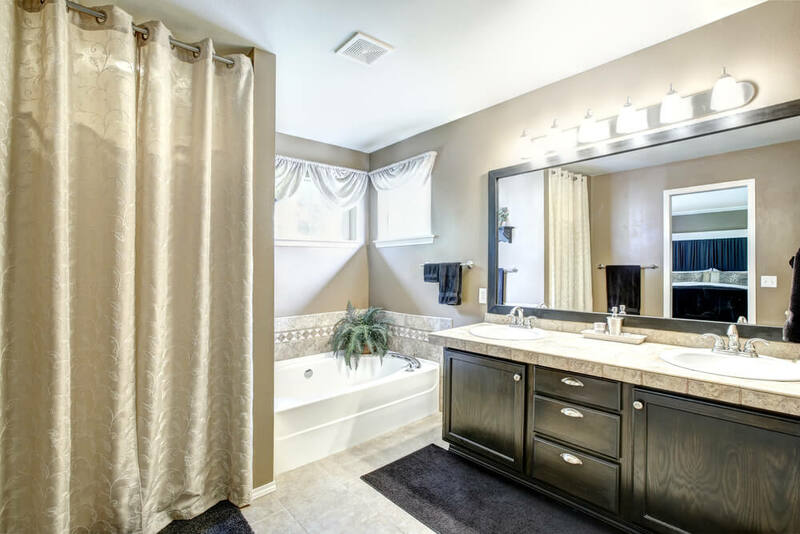 Another inexpensive way to add color to a neutral bathroom is through textiles such as a bathroom rug, robe and towels. 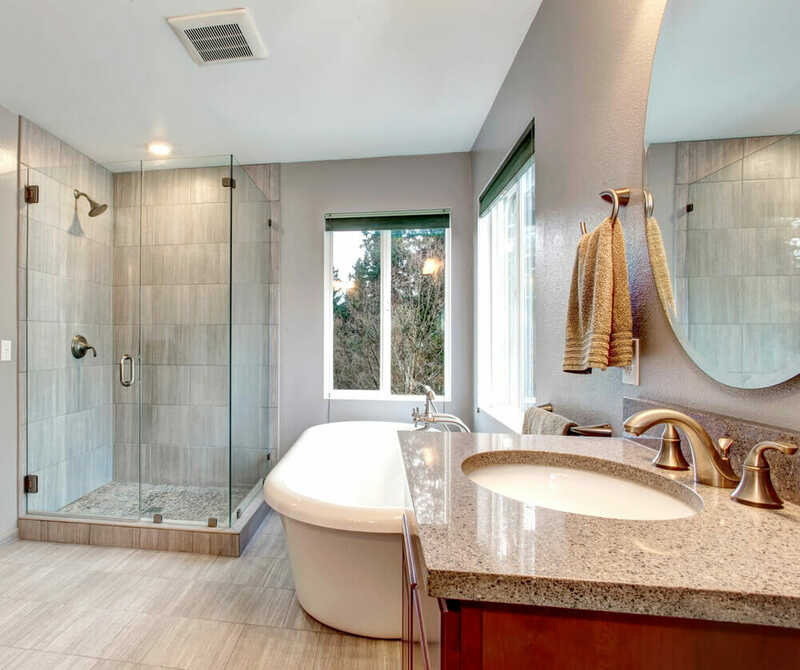 This bathroom offers a unique twist in providing open support to a tub that would traditionally be placed within a tub surround. 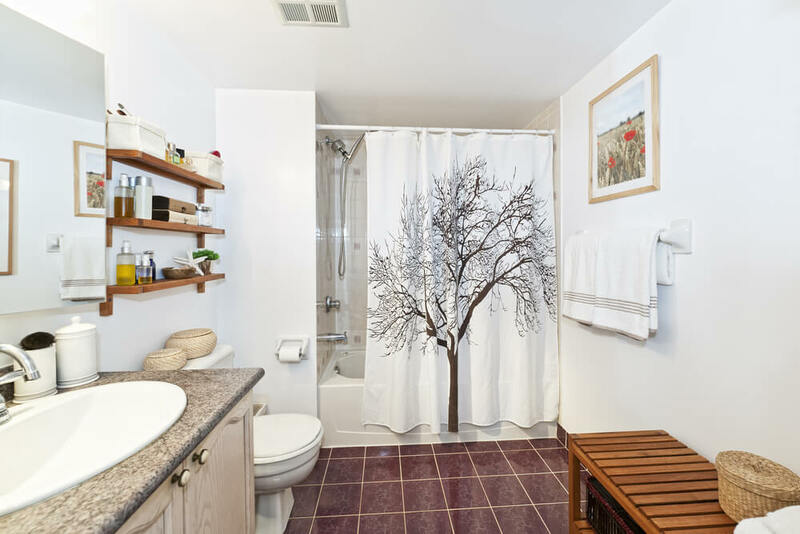 Use the free space above the toilet to install shallow shelving for bathroom accessories and decor. 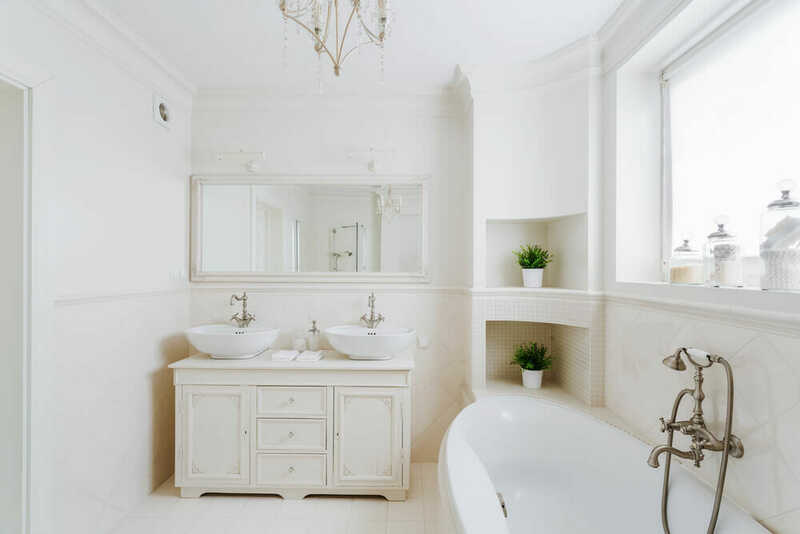 The simple color scheme in this bathroom creates a dramatic elegance. 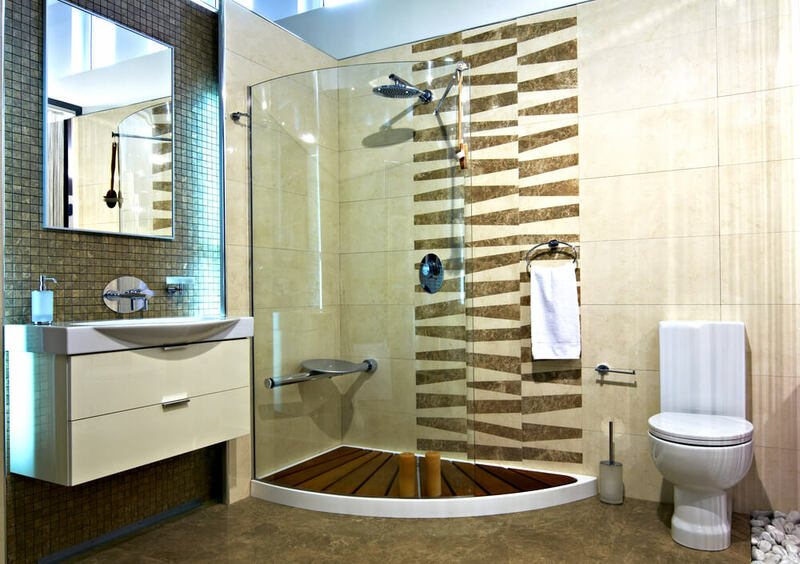 A corner shower is ideal for small bathrooms with limited floor space. Crown molding, wainscoting and wallpaper create a delicate, feminine space to begin and end the day. The extra space above the tub is turned into a small shelf for storage. When located in high-traffic areas, an area rug provides a soft place for walking without getting to close to water sources. A beautiful, hanging pendant light accents the curved ceiling in this bathroom space. A free-standing tub is a beautiful addition to any bathroom, when space allows. 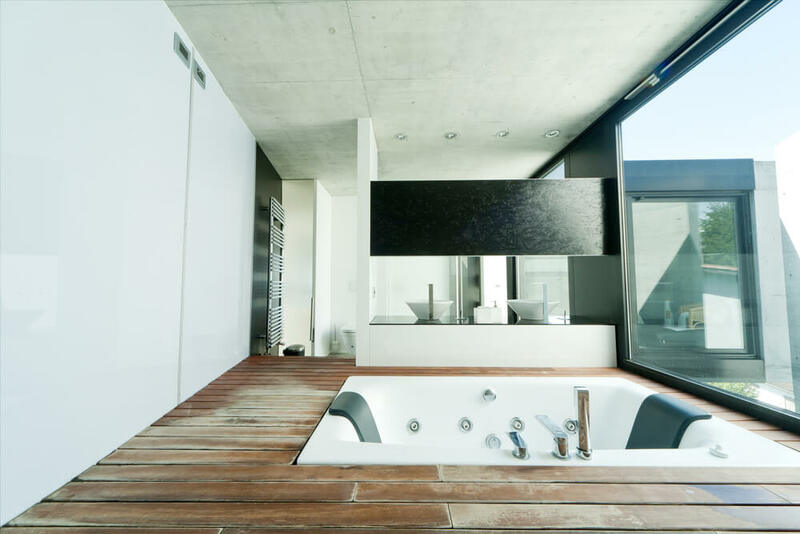 The jacuzzi tub in this penthouse bathroom provides a majestic view of the city below. 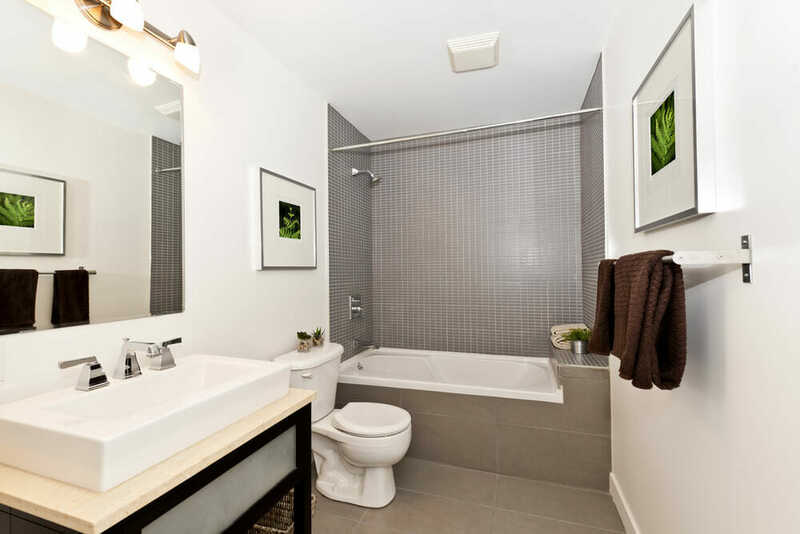 A round tub reduces the incidence of bruised shins when navigating in this small bathroom. Textured wallpaper plays well with the warm woods and bamboo accents in this space. 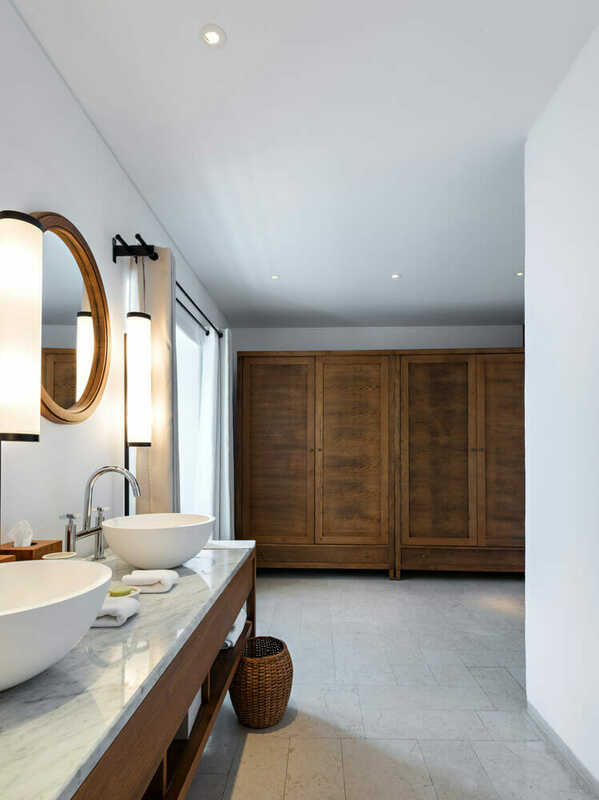 Delicate, round pendants provide soft light to this impressive bathroom space. 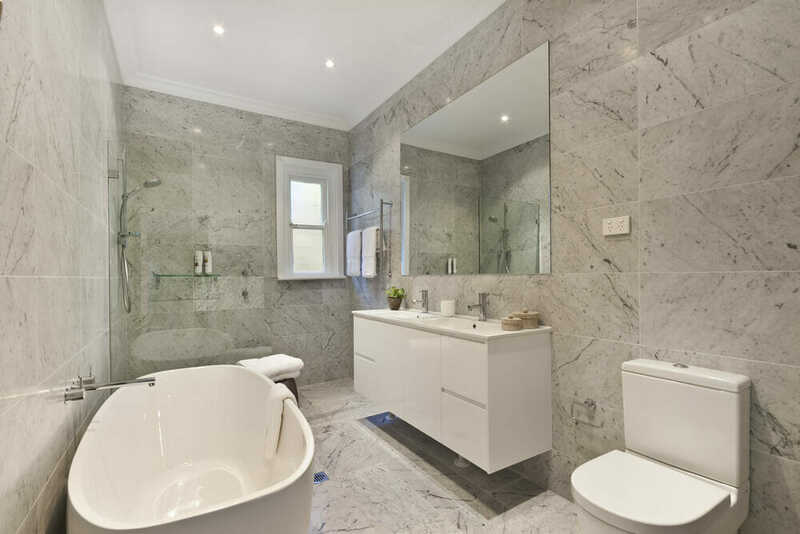 An inset area for a jacuzzi tub adds to the luxurious feel of this traditional bathroom. 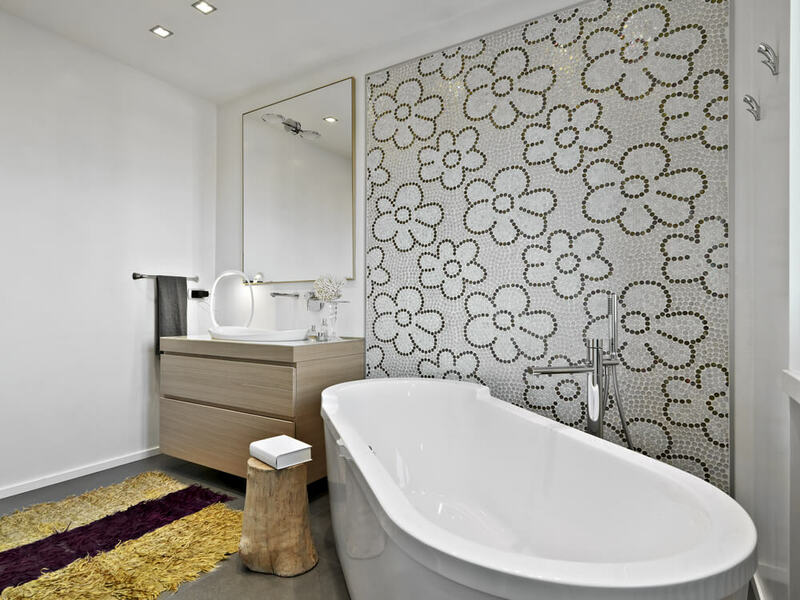 The lace-motif, feature wall behind the tub creates division between the bathroom area and the remainder of the master suite. The gilded mirror placed above the vanity adds a touch of personality in this modern bathroom. Floating shelves creates great storage opportunities in small areas that would otherwise go unused. 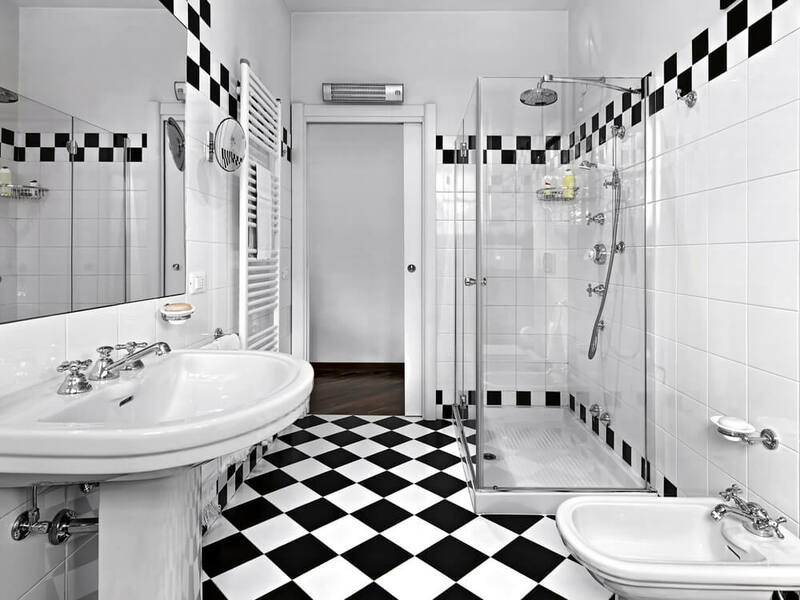 Graphic black and white tiles create a retro vibe in this simple, bathroom. A long, uninterrupted counter space is great for display and use of bathroom accessories. 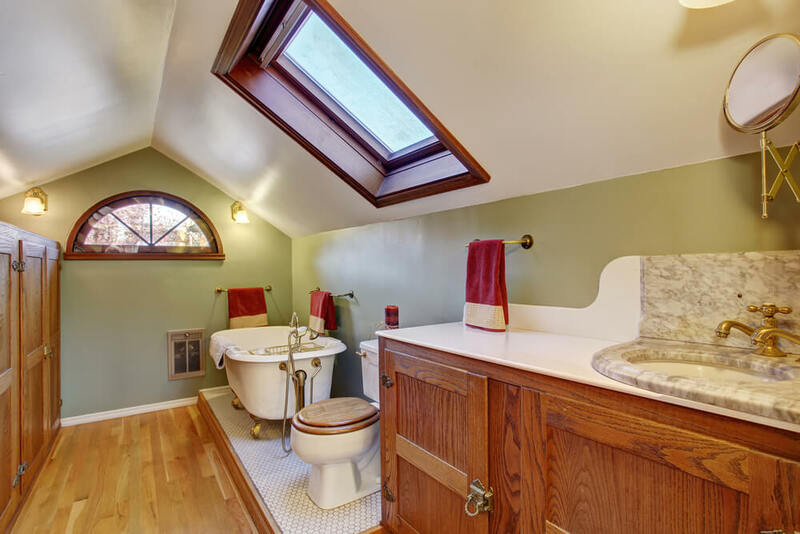 This indoor bathroom feels more outdoors with its large open windows. 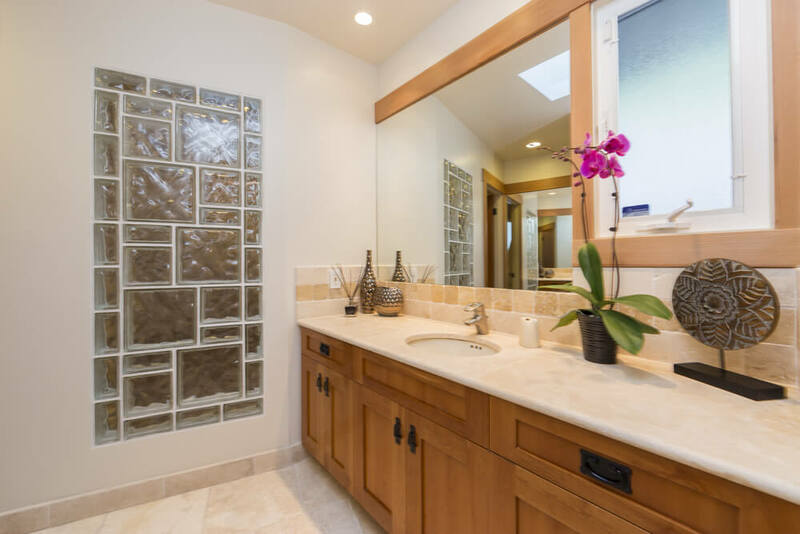 Rich, traditional accents in the vanity, tile and mirror add luxury to this intimate bathroom space. When installing a free-standing tub, make sure to supply an additional side table for easy access of bathroom accessories while bathing. A long, recessed, jacuzzi tub is ideal for bathrooms that are rectangular rather than square in shape. When a tub is placed at a slightly higher level, install a step below to make it easier to get in and out. Installed on the floor, round, white penny tile adds a vintage aesthetic to this contemporary bathroom. The tile work and paint color make this small bathroom feel like a restful retreat, without requiring substantial renovations. 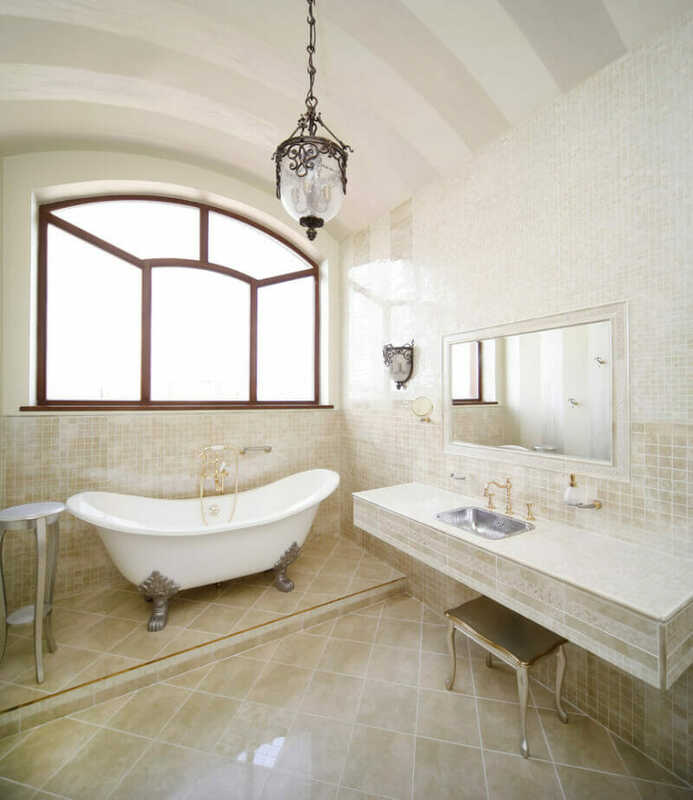 The arched windows above this wood-framed tub surround provide lots of natural light. The black accent tile following the perimeter of this spaces creates creates the illusion of a large area rug. Built-in cabinetry is excellent for providing storage while not taking up valuable floor space. 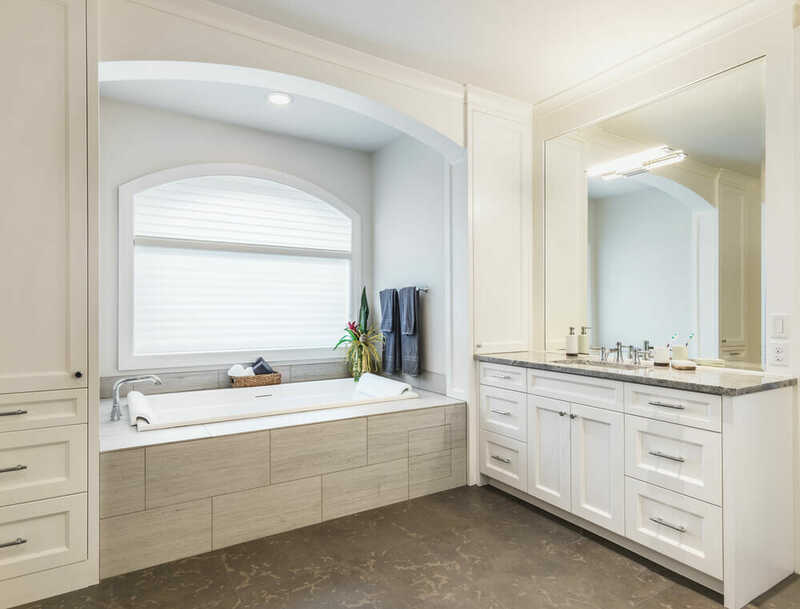 This double vanities in this space do not interrupt the flow of the beautiful, wood flooring and seamlessly blend with the sleek, white subway tile. 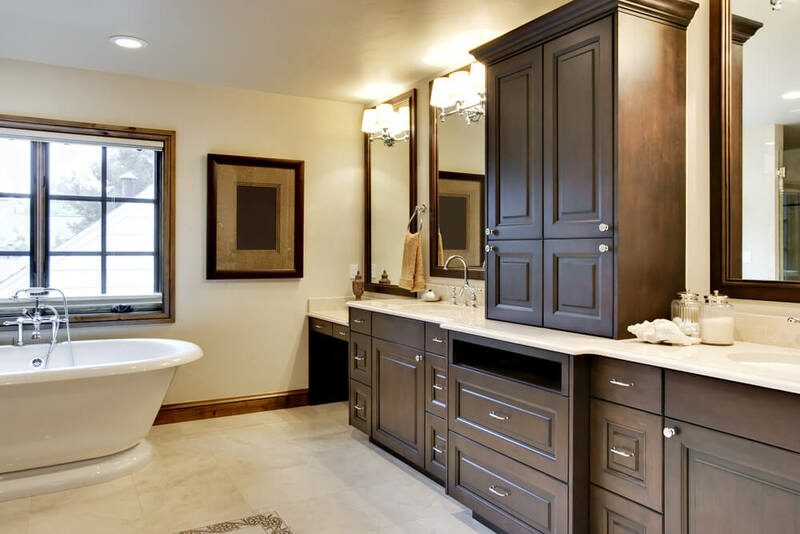 The color scheme and natural woods in this bathroom create a warm, inviting atmosphere. 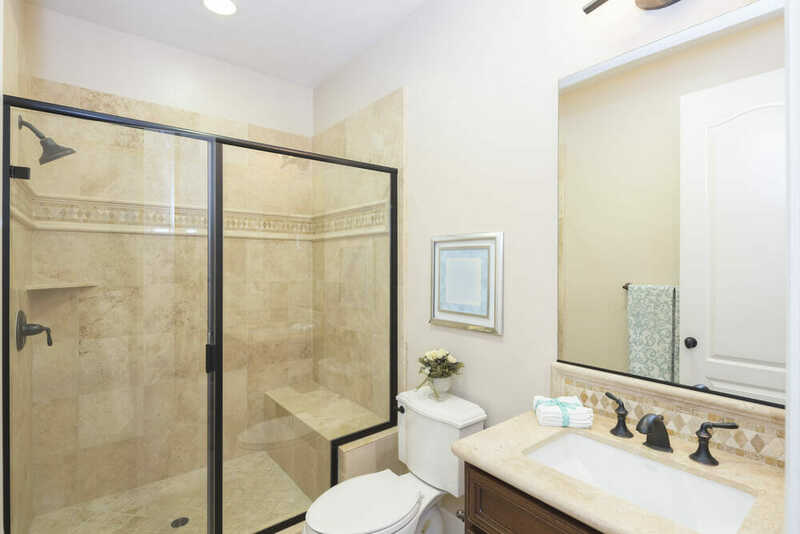 A small shower stall can be made to feel bigger by installing seamless, glass doors. 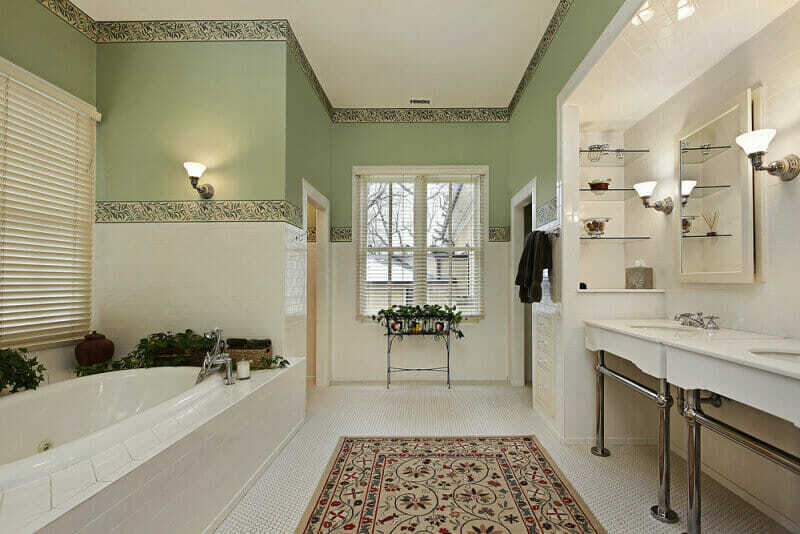 The vintage-inspired pedestal sinks and penny tile coordinate well with the traditional design of this bathroom. 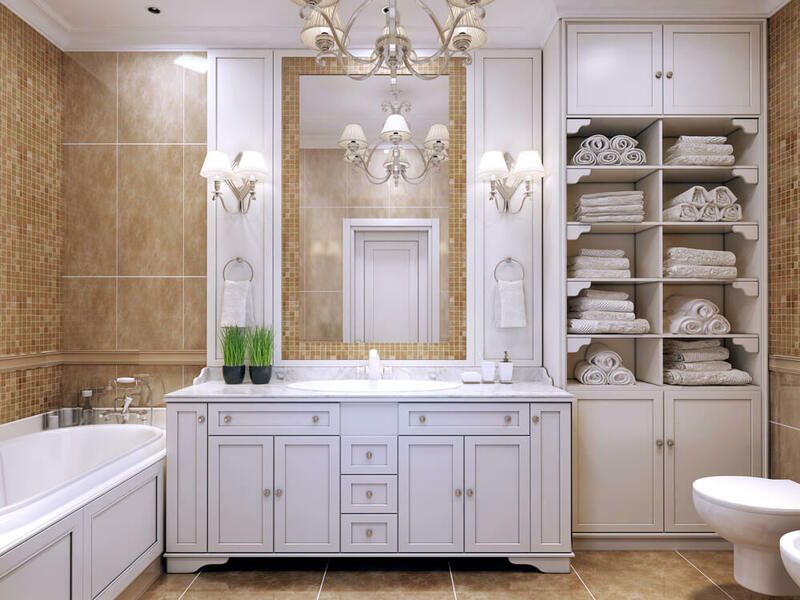 The cabinetry in this space provides a separation between this his and hers vanities, as well as plenty of space to maneuver without bumping in to each other. 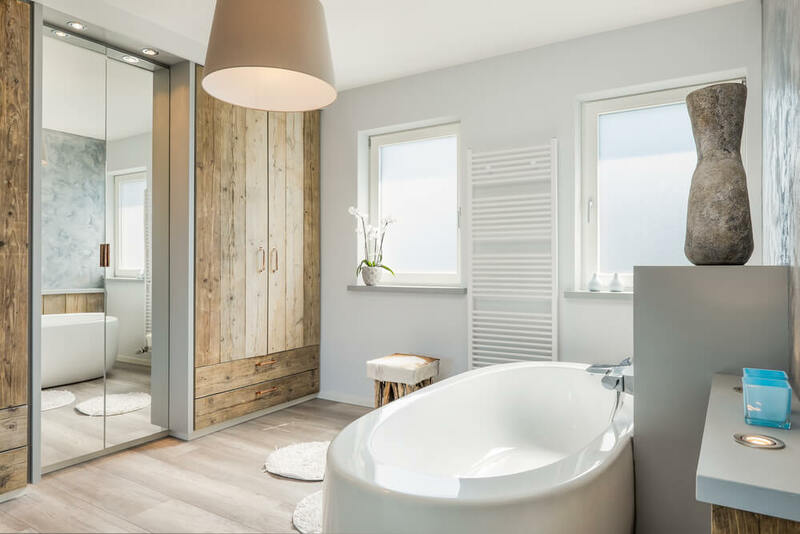 Wood floors can be used in bathroom spaces when attention to taken to avoid standing water and spills. 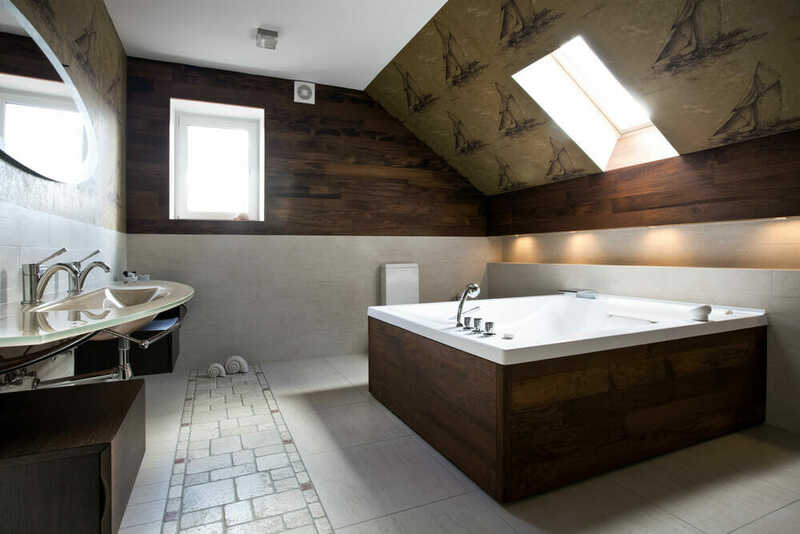 The dark woods and sailing ship motif of this bathroom make it feel inherently masculine. Additional lighting installed into the tub surround provides a clear view of the floor for late-night visits to the bathroom.